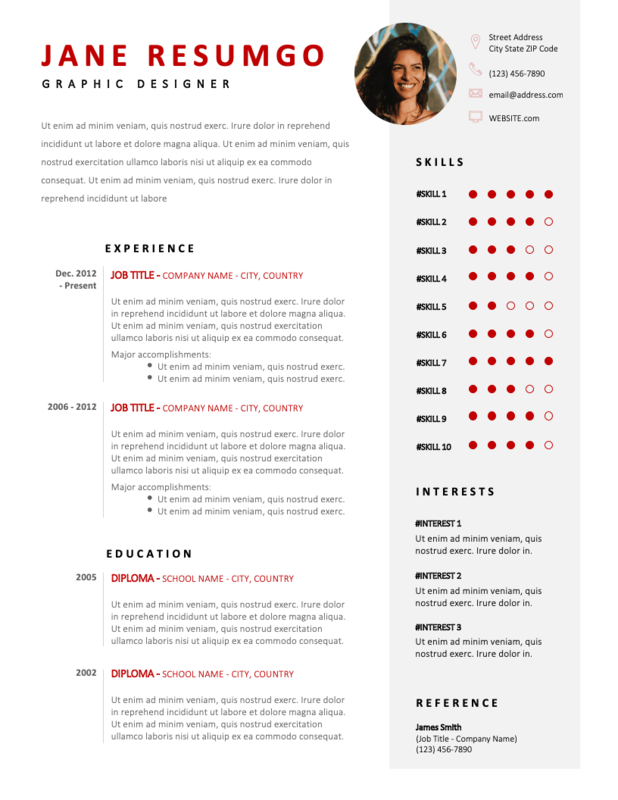 Hekate is a free contemporary resume template. Sleek two-column layout with modern style. Light gray and red elements. Hekate offers a neat and clean structure. Your resume will surely make the first difference, getting a special interest and decisive attention from the recruiters. On the left side, the main body. Display your name on top, your job title, and personal statement or summary. Then below, you will have enough room to feature your experience and education. The chronology of the events is clearly presented, the dates being displayed on a left extra-column, and separated from the content by a vertical line. On the right-hand sidebar, a full-height gray banner. On top, detail your personal information, list and rate your skills (on a 5-point/dot scale), describe your interests and include any reference you’d like to share.